This Salmon Sun-Dried Tomato Jalapeno Sauce is made with my favorite garlic spread from Majestic Garlic, Sun-Dried Tomato Jalapeno. If you haven’t tried it, it is excellent as a spread for a sandwich, or a dip for veggies. One evening I decided to add it to this sauce and it made it that much better! It’s my new secret ingredient. The salmon for this dish is seasoned with my Sugar and Spice Rub. It’s one you ought to try if you haven’t already! You can also season the salmon with salt, pepper and olive oil before cooking or use leftover cooked salmon. I used hand-made angel hair pasta from Lisko Artisan Deli, which is sold at my local Farmers Market. If you don’t have access to fresh pasta, dried and any other brand will work and be just as tasty. Keep in mind that if you are using fresh pasta and don’t immediately add it to the sauce, drizzle a little olive oil on the pasta to prevent sticking. Once you have your mis en place ready, this recipe is a breeze to put together. You will love the flavors of the sauce with the delicate angel hair noodles. Put your chef’s hat on and make it a pasta night! 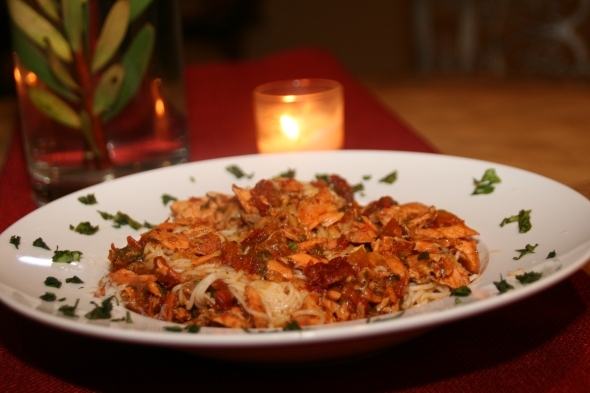 Salmon, spice and everything nice makes this angel hair pasta dish one that you don’t want to miss! Place rack in upper thirds of oven and set to broil. Line baking sheet with foil and lightly brush with evoo. Place salmon on foiled tray and brush entirely with evoo. Sprinkle then pat top side of salmon with rub. Place in the oven and broil until just cooked thru, about 25-30 minutes (cooking times may vary depending on thickness). Heat 2 tablespoons olive oil in a large deep skillet on medium-high heat. Add garlic and sauté for 1 minute. Add red pepper flakes and sauté 1 minute longer. Add sun-dried tomatoes and sauté 1 minute longer. Add 2 cups diced tomatoes and sauté 2 minutes longer. Add sun dried tomato jalapeno garlic spread, half cup fresh basil and bring to a medium simmer. Cook until tomatoes are softened, about 5 minutes. Add remaining two cups diced tomatoes and simmer a few minutes longer. Pull apart cooked salmon with two forks. Be sure to discard any bones. Add salmon to sauce. Season with salt and pepper to taste and keep at a low simmer. Bring simmering water back to a boil, and cook pasta (uncovered) to your liking, stirring occasionally (About 3-5 minutes if using fresh pasta) Strain and toss with salmon sun-dried tomato sauce (may be served separately if preferred, drizzle angel hair pasta with evoo to prevent sticking). Serve with remaining ½ cup basil and parmigiano reggiano cheese.